Only 14% of young women who enter university for the first time chose science-related fields of study such as engineering, manufacturing and construction. This is one of the headline findings of a new report from the Organisation for Economic Co-operation and Development that examines gender equality in education across 64 countries and jurisdictions. In comparison, 39% of young men who entered university chose to pursue one of those fields of study. Gender has always been important in education. What the report – based on the 2012 Programme for International Student Assessment (PISA) tests – reveals is the extent of the gender gap in science, technology, engineering and mathematics. The university statistics won’t come as a complete surprise to many – though the magnitude of the gender difference is worryingly large. 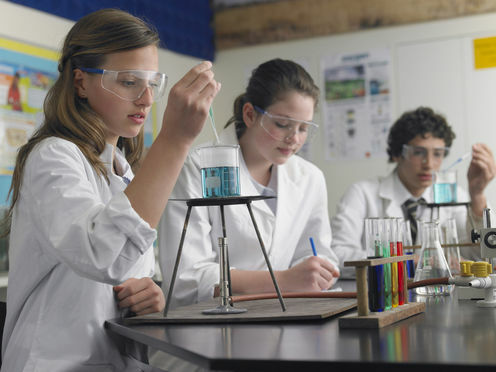 But the school-age data, drawn from 15-year-olds who take the PISA tests every three years, contains an even more alarming message: the UK’s gender gap visible in school results for science subjects is among the largest. British 15-year-old girls are reported as doing 13% worse than 15-year-old boys. In Finland, girls do 16% better than boys. Of the 64 countries that took the tests, the UK takes 61st place. Many will feel that the findings are hard to believe. They certainly don’t agree with the annual GCSE results in England, Wales and Northern Ireland and the equivalent examinations in Scotland. For example, in the 2014 results for the single science GCSE, 56.2% of boys achieved grade C or higher compared to 61.8% of girls – a gender gap of 5.6% in favor of girls. But if the OECD’s findings are valid – and I suspect PISA is a higher quality science test than is a typical GCSE in science – they are deeply disturbing. We know that students who do less well in science at school are less likely to continue with it, and we also know that students who take STEM degrees end up glad that they did and get well-paid jobs. This has nothing to do with biological difference between the sexes. Across the 67 countries that took the tests, the average gender difference in science was only 1%, so the explanation must be a cultural one. The OECD report has a mass of statistics about gender differences in such things as attitudes, self-regulation, and girls’ lack of self-confidence in their science and mathematics abilities. What it comes down to is the messages that girls hear from others, and then internalize. Despite television presenters like Alice Roberts and the growing prevalence of senior female scientists in the UK – Dames Athene Donald, Julia Goodfellow, Julia Higgins, Julia King, to mention just four – too often it seems that girls hear that science is not for them. Or rather, subjects such as human health are OK for them to pursue but not the “hard” sciences like physics and chemistry – and certainly not computer science and engineering. Campaigns like Let Toys Be Toys are doing their bit to tackle gender stereotyping at an early age, but it still persists. Schools should be doing more to protect both girls and boys from society’s gender stereotyping. When I trained to be a school teacher back in the 1980s, we had lots of sessions from sociologists and others about the importance of gender, social class and ethnicity and the assumptions that society – and we as teachers if we weren’t careful – all too often made about pupils. Today, time pressures and changes to how teachers are trained mean that new teachers are much less likely to receive the depth of training on this topic than we did. The preoccupation among politicians from all political hues when they are in power with students’ school examination results means that schools now have less time and determination to do what they used to do well – namely to produce self-confident, rounded citizens. We need to get back to realising that how school students see themselves and their subjects is important. If we don’t, too many young people, especially girls, will continue to believe that science is not for them and that they aren’t really good at it – and by thinking that way, they won’t be. By Michael Reiss, Professor of Science Education at UCL Institute of Education. This article was originally published on The Conversation. Read the original article.